Many people live with the misconception that the most challenging part of taking care of a baby is the dirty diapers. But baby spit up is actually the reigning king because it has something that dirty diapers rarely have – the element of surprise. And our son has impeccable timing. He has a sense for when you’re wearing nice clothes or have recently changed, and he’ll strike when you least expect it. You’ll be holding him and he’s looking around contentedly and then suddenly, without warning, you find yourself with a lap full of formula. For Timothy, it’s like a game at the State Fair – ready, aim, spit. I now separate my sweaters into 2 different drawers — one family of sweaters that TRBL can use for target practice, and one set that is not intended to be worn within 20 feet of the little Howitzer. Laura and I are conscious of the state of the clothes we wear in public, but if you stopped by the house unannounced, you might assume that we’re in the middle of a painting project, when we’re actually just wearing our baby spit up jumpsuits. Timothy has been struggling again with diaper rash. Nothing like the issues just after his recent surgery, but it’s clearly not comfortable for the little guy. One benefit of the rash is that T needs to air out, which means a lot of naked time on the blanket for him. This is when the kid really comes to life. Most babies like to be naked, and T is no different — he views clothes as merely a way to accessorize with his red hair. And by the way, we’re going through diapers like dessert bars at a church picnic. The volume is definitely higher when we’re in diaper rash season, but even during normal times, it’s pretty crazy. The other day, we realized that we had bought a box of the wrong size of diapers and were down to the last diaper that fit him. You want to be sure to use that last diaper really, really wisely. When we first told people that we were having a baby, they often responded, “Well, that’ll sure keep you young.” (which might be another way of saying “Glad I’m not you”) Eight months into this science experiment, we still believe that it’ll keep us younger and we’re still hearing those comments, but now we’re getting at least as many people commenting that my hair is getting greyer. Timothy has recently started a funny habit — waving his hand in front of his mouth. It makes him look like he just ate fish for lunch and is looking for a breath mint. One of the challenging aspects of the past year has been wondering where the ‘line’ is – that is, what is Timothy capable of doing? It sounds silly because every single parent worries or thinks about their child’s potential and what they can do physically and cognitively (mentally). It’s very normal. But it feels different with Timothy than with Elisabeth and Catherine. The question is -– how high functioning is he and will he be? It’s hard to know where to set your expectations. Many people say ‘don’t set the bar too low’ or ‘you’ll know what he can and can’t do’, but it’s not so simple. I know that the biggest reason for our worry is because this is still very new territory for us and we’re still learning to accept the whole situation. 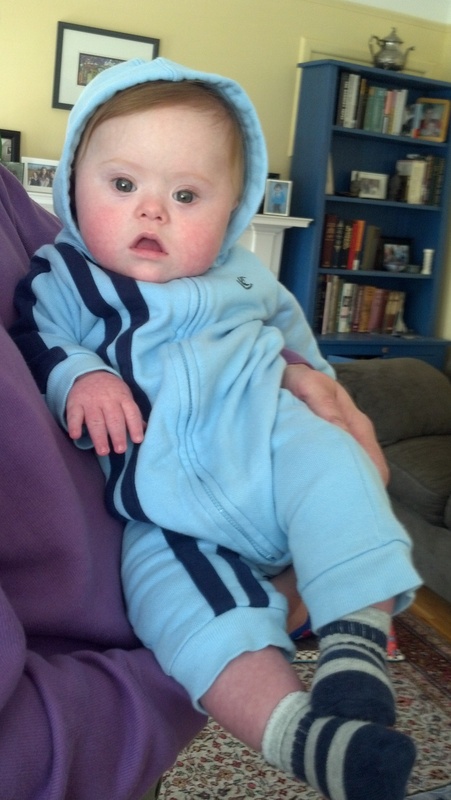 We’re simultaneously in denial about Down syndrome — especially since he’s so active and alert — and also probably overestimating its importance. I know that the lesson for us here will be that Timothy is mostly like any other child, and really the issue is not Timothy – it’s us learning to just enjoy T as he is today; to stop letting our worry get in the way of us appreciating this guy’s babyhood. We’ll find that Down syndrome is just one piece of the TRBL puzzle, and it’s not even the biggest piece. But for now, it’s hard not to keep staring at and questioning this big thing we don’t understand. In the near future, we’ll shrink the Down syndrome down to its proper size, like collapsing a camping tent. The true picture of Timothy will come into view, and we’ll realize that being a red head is as much as part of him as the Down syndrome. All of these lessons and takeaways are super easy to forecast and to say right now, but we’re still working on really accepting it all. But we’ll get there soon enough. And hey — even then, I bet the wee man will keep us on our toes with an occasional spit up ambush. This entry was posted in Spit up and tagged Clothing stains, Death by diaper, Waving. Bookmark the permalink.